Now I’m nearly six years away from that huge jump into the unknown i.e. stopping benzodiazepine drugs cold turkey after 40 years of use for sleep. That day was to prove the start of crippling anxiety and pain that was to continue in windows and waves up to the present day. I believe this six year mark is the time it’s taken my brain to recalibrate and finally show obvious healing. I’ve fought my way through day by day and through a multitude of symptoms that caused my body to become a relentless torture chamber of fear and agony, sometimes so bizarre that I never even spoke about this or I would have been given a label and packed away to a psychiatric hospital. I’ve prayed for the release of death but my prayer was never answered for which I’m now grateful. I’ve had little medical support and my one trip to an Accident and Emergency Department for acute pain in my teeth and jaw sent me scurrying home to hide in the safety of my bed even further traumatised. The disbelief and attempts to label me as a mental health problem made me realise the awful situation that all Benzo sufferers face if they dare to seek medical help. If I hadn’t understood what was happening to me, even before I stopped the drugs, I could well be still drugged to this day and may not even be alive. As it is I am well and happy and gaining back my lost adult years; my head is clear, my sleep has mostly returned and my motivation and energy are emerging. Recovery is an individual experience and can’t be compared to anybody else’s, it’s unique and personal. It’s also a process that we follow according to our own beliefs, attitudes and values which are formed from our own conditioning and self concepts. The past has gone, the traumatic experience of Benzo withdrawal has gone, our anger at what’s been done to us must be released as well as we seek ways to return to a happy and stable life which doesn’t include the need for a drug to help us through our days and nights. Recovery means the development of a whole new outlook, a new way of understanding the meaning of life and why we have been made to suffer such an indescribable nightmare. We have to let go of that experience but at the same time use it to feed our future and so the years ahead are meaningful and productive. It’s nothing to do with seeking relief for the symptoms any more (although we will have learnt that these have to be experienced and fought without further drugs, including some supplements) it’s now focussed on getting to know ourselves and becoming the best example of that we can be. There’s still a long road ahead for those of us that have been drugged for decades but I look on that road as an exciting time in which I operate in an entirely different bubble of existence as I learn new ways of thinking and new ways of dealing with the normal and inevitable stresses that life brings with it. The upshot is that I have learnt that life doesn’t need a pill to live it but needs a greater understanding of the person deep within us and the limitations and possibilities within that person. Everyone reading this has the potential for complete recovery even if that recovery may not be what they expected. We don’t return to our former selves we return to a higher self and one that has enormous strength, resilience and understanding. 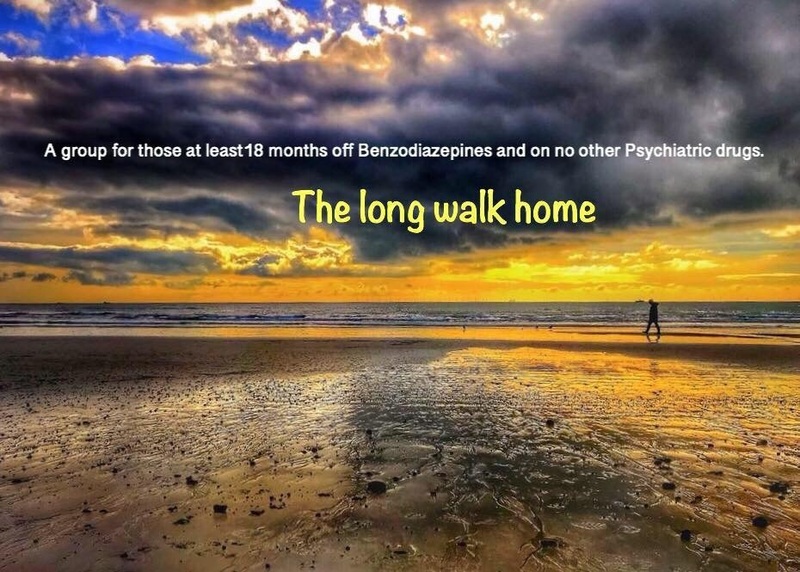 (The photo is from the Facebook Beating Benzos Protracted Group where members over 18 months off benzos and other drugs can discuss their concerns and observations).